The exercise bike is the most common type of home fitness equipment and is a great choice for anyone who doesn’t regularly exercise as well as those who are experienced cyclists. These are the most important features to look for when purchasing a new exercise bike. You will want to be able to adjust the seat to the height of your hips as this will prevent you injuring your back and joints. The seat should be able to move up and down, some bike seats can also move horizontally for maximum comfort. This feature is important as it will determine the comfort and fluidity when cycling. If too light, it may feel jolted when pedaling The flywheel weight will be dependent on your goals. Experienced cyclists can go for an exercise bike with a flywheel weight of 15 kg or more. Those who partake in regular exercise and are sporty should look for a bike with a flywheel weight between 9-14 kg and beginners, 8 kg or less. There are two types of resistance for exercise bikes, mechanical and magnetic. Mechanical resistance is activated by turning the adjustment wheel, whereas magnetic resistance is directly modified from the bikes control. If you’re looking for a bike which allows you to have a predefined workout program, magnetic resistance is what you need the bike to have. Some exercise bikes are now designed to connect to smartphones, iPads and tablets. This allows you to control your resistance level, as well as creating new training programs and checking stats. These features are usually found on the higher spec and more expensive models. Look for an exercise bike which has adjustable handlebars so that you can find your optimal position on the bike. Some bikes also have pulse rate monitors on the handlebars. As well as the appearance of the bike, you should consider design features such as whether the bike is an upright bike a recumbent bike. The recumbent design has a back support and enables you to sit properly on what is more like a chair. An upright exercise bike is more modern and offers more flexibility. Check out the video below for more ways on how to choose the right exercise bike! What are the Health Benefits of Riding an Exercise Bike? Exercise bike are great for burning calories and keeping in shape at home. Burning calories means you will have an easier time managing your weight and can workout for less time, while still producing good results. A stationary bike provides a low impact workout which doesn’t put stress on the spine or the joints in the hips, ankles or knees. This also means that less physical injuries are likely to happen when working out. People recovering from an orthopedic injury will often participate in indoor cycling as part of the rehabilitation. Another benefit of using an exercise bike to workout is that the it can help lower the risk of coronary artery disease. ACSM suggest that you should get at least 150 minutes of moderate to intense exercise per week. Keep pedal cadence at around 90 rpm (revolutions per minute). Change the resistance level if this is too easy. Adjust the pedal straps so that your feet feel comfortable when cycling. Push down on the balls of your feet to work your hamstrings and leg muscles. Don’t have the saddle too low or high, this will put you in the wrong position and could cause injury. It should be in line with your hip height. Don’t hunch over the handlebars as you may develop back and neck pain. Keep your chest up and shoulders back. Don’t worry about bulky muscles. Resistance will improve muscle tone. 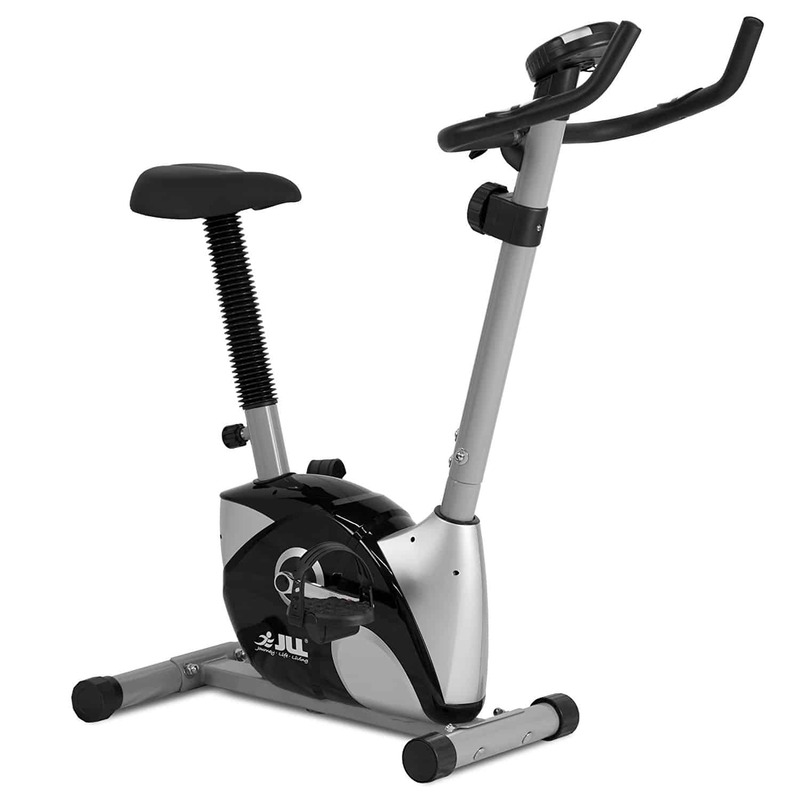 The exercise bike has a 4 kg flywheel, self leveling pedals and plenty of programs for workouts. The resistance settings provide a varied workout. Features include a drinks holder, wheels for transportation and a 5.75 LCD display. The machine does have it’s cons, it can be noisy of not assembled properly and can be difficult to put together. Budget range bike which has a stylish black and grey appearance. It’s a compact exercise bike which won’t take up too much room. 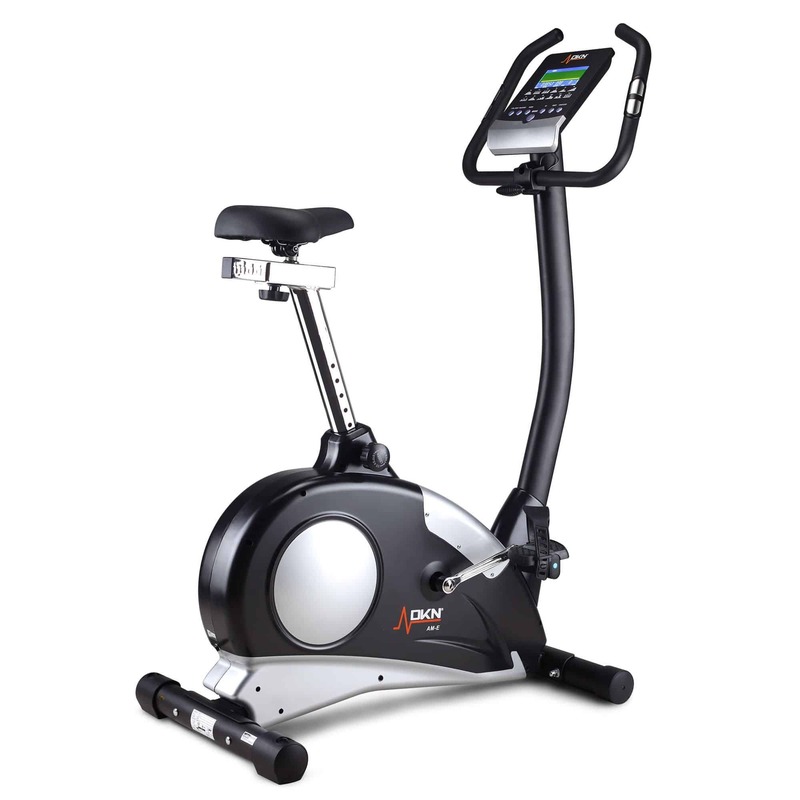 Features include pulse monitors on the handlebars and a 4 kg 2-way flywheel for mid-level resistance. It is fixed rather than folding, if you are taller than 6ft, you may want to look at a bigger sized bike. Choose between 12 pre-set biking programs and electronically adjust the tension levels to 32 different levels. The monitor shows the user time, distance, pulse rate, RPM, speed and calories burned. It can be noisy at times and lacks handlebar adjustment option. There are no wheels for transportation. Displays speed, distance, calories, time and scan. Space-saving and stylish exercise bike. 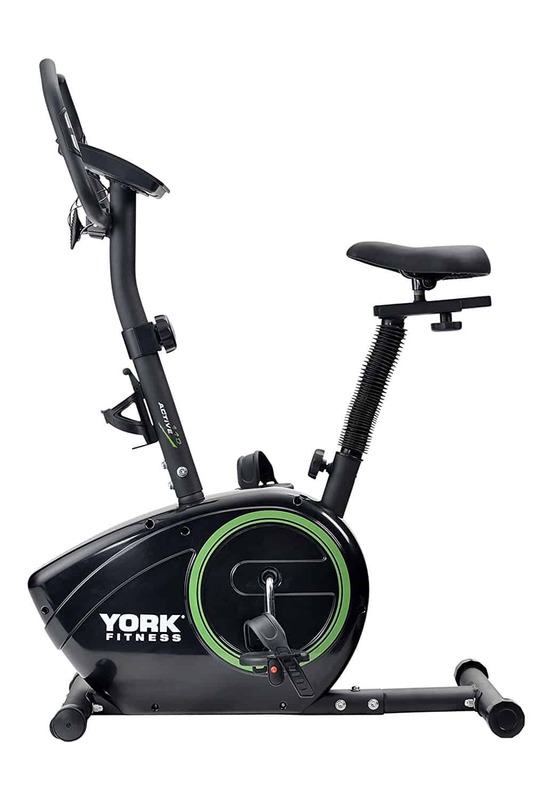 The 13 kg flywheel and resistance offer an effective bike for a range of users with different fitness requirements. Good for home use but not of gym standard. The saddle isn’t as comfortable as some of the other bikes. 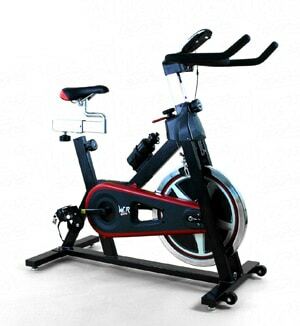 The exercise bike has a sturdy and heavy duty construction. Simple LCD panel shows time, distance, calories burned, odometer, scan and pulse rate through the handles. There is also a water bottle in the middle to keep hydrated. It is heavy and doesn’t have a folding design so not as easy to move around. All five of these exercise bikes offer you the potential to get fit from your home, but some lack certain features which make working out an enjoyable experience. 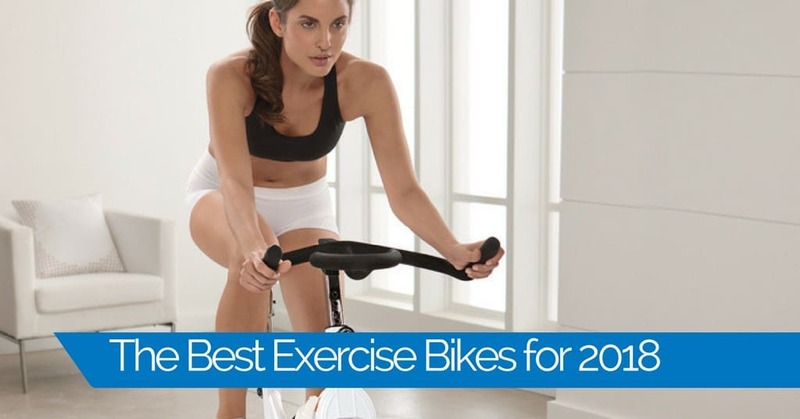 After comparing the top five, it’s clear that the DKN AM-E Exercise bike outshines the others in this group. 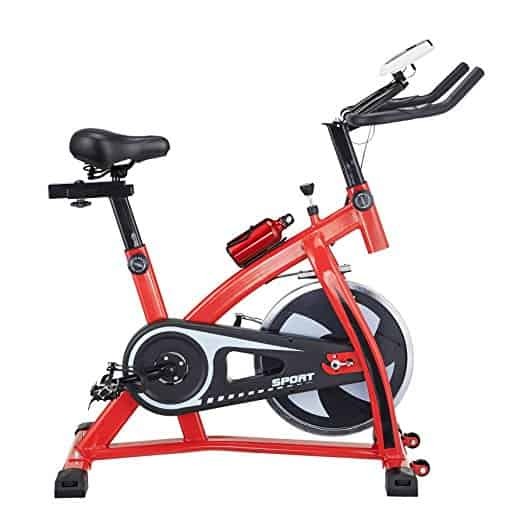 It has more tension levels to choose from that the other bikes and also comes with a range of preset biking programs which is perfect for a convenient workout. The sleek design wouldn’t look out of place in any modern home or gym and it will provide an enjoyable and intense workout at home.